Can you imagine leaving your home, family and crowded city life and travelling to the other side of the world to start working on a farm in what seemed like the middle of nowhere? What if you were only 14 years old? 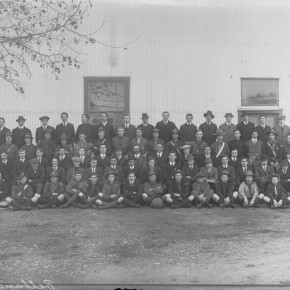 2,000 boys seized this opportunity during the 1910s and 1920s when they migrated from Britain to take part in South Australia’s Farm Apprenticeship schemes and a new exhibition, Barwell Boys, at the Migration Museum celebrates 100 years since the arrival of the first group of boys in 1913. 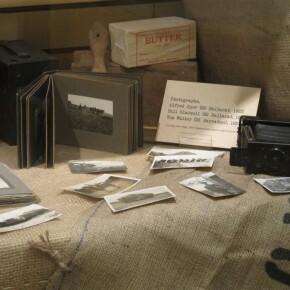 The exhibition runs to the end of August, focusses on the boys’ engaging stories – from day to day life, such as learning how to drive up to 10 horses at a time and lumping 80+ kg bags of wheat, through to the impact of the Great Eastern Drought, the First and Second World Wars and the Great Depression. The display reveals the pros and cons of the scheme, shows how far farming practices have come since then and celebrates the contribution these migrants made to our state. The exhibition premieres in the Migration Museum‘s community gallery, ‘The Forum’, from 3 June to 30 August 2013. It will then appear at the Royal Adelaide Show from 6 to 14 September 2013, followed by a tour of country shows and field days across SA. 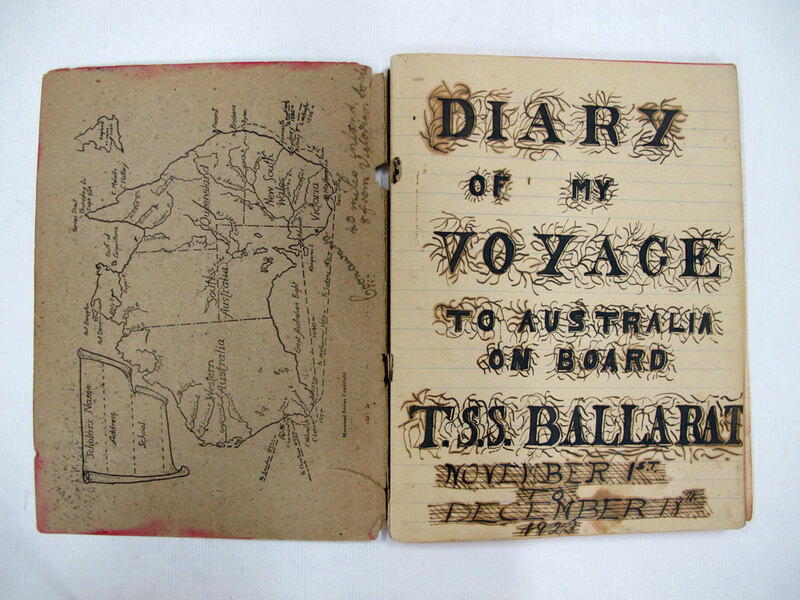 The handwritten diary of my father, Bill Gladwell, a Barwell Boy from Essex England, was written during his trip to Australia aboard the S.S. Ballarat in November/December of 1923. 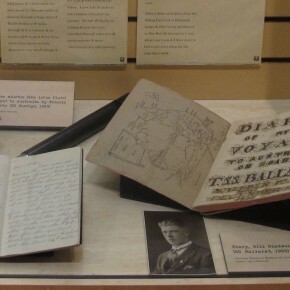 The diary is a black cloth covered exercise book, notable that it has a map of Australia inside the front cover, even though purchased in England prior to departure. The diary gives a clear picture of daily shipboard life through the eyes of a fifteen year old boy seeking new opportunities. Not surprisingly there are times when it reads a little like ‘Boy’s Own Paper’ and it tone is optimistic. Bill describes how a group of about sixty young chaps his age (ranging from 15 to 23) kept themselves entertained during the six week voyage around Africa via the Cape of Good Hope and Capetown, South Africa. Many of them were away from parental control for the first time and were ready to try out some of the perks of ‘adulthood’ such as smoking and gambling (card games and betting on the daily distance travelled by the Ballarat.) Other activities included deck games and general ‘horsing around’, and some lasting friendships were forged on this journey out to South Australia. Going ashore in Capetown was clearly a highlight as they explored the town, even ‘having a go’ at Tabletop Mountain, which forms the backdrop to Capetown. Bill had grown up as the eldest son of a family of six, and his father was a veteran of the First World War whose life had been severely affected by being gassed at the battle of the Somme. After the War his father and mother lived in a ‘found cottage’ at Upminster Farm near Upminster Common, Essex, where he was the farm labourer. From an early age Bill had helped his father on the farm, and fell in love with the Clydesdales which they used to work the property. They were a very poor family but nevertheless Bill won some sort of parish scholarship which gave him entry to Chelmsford Grammar School (CGS) now known by its 450 year old name King Edward VI Grammar School. He had his heart set on being an architect and going to Cambridge University, but his father, following the ‘son follows father’ rule of agricultural life of the day, had other ideas. At the end of Bill’s second year at CGS in 1922 aged fourteen, his father pulled him out of school to work on the farm with him. This led to a furious argument, with both father and son as bull-headed as the other. As a result Bill ran away to sea, they were living not far from Tilbury docks, and at the age of fourteen he worked as a stoker on a Cunard liner for a year. On his return in 1923, he worked briefly on an orchard near the family home, but his father was still furious with him. While Bill was away, his mother had heard of a farm apprenticeship scheme in South Australia called the Barwell Scheme, and encouraged him to apply. He was accepted and set out for South Australia in November that year. He was not to return to England until 1966 with his wife Dorrie, a South Australian girl he had married when a soldier in the Second World War. His mother had died not long before, but his father was still alive, and so after 43 years they were able to reconcile. After my father died his ‘Barwell diary’ was amongst his possessions I inherited, and I finally got to read it at the age of 42. It gave me a bigger picture of him, as he had continued to use the diary after the boat journey was over. He had recorded information about the places he had been sent to as a Barwell Boy, his wages and supplies, and as he got older he recorded many poems in bush ballad style (most of which he could recite ad lib.) and many of which showed that the ‘young man’s fancy had turned to love’. In growing up I had some difficulty knowing just how much of Dad’s account of himself was actual, or heroic verging on myth, so the diary gave me something both tangible and factual to understand him. It helped me to make sense of so much he had wanted for me, and also why he was a ‘larger than life’ character to me, and how some of his story with his father had been repeated between us.